In a recent post I outlined some of the main findings from our analysis of Census employment data on the Industry sector in the Western Region. Our recent report ‘Industry in the Western Region: Regional Sectoral Profile’ also examined agency assisted Industry jobs and they are the subject of this post. Each year the Department of Business, Enterprise & Innovation (DBEI) (and formerly Forfás) conducts a survey of all firms in Ireland who have ever received assistance from IDA, EI or Udarás na Gaeltachta. This is published as the Annual Employment Survey (AES) and these firms are referred to as ‘agency assisted’. They are limited to Industry or International Services firms currently or with the potential to export. For Industry this would include most enterprises. Unlike Census data, which is based on where a person lives, AES data is based on where the company is located, so is the location of the job, even if the person travels from another county. The latest AES data is from 2017 when there were 49,435 agency assisted Industry jobs in the Western Region. From a low of 38,000 in 2010, assisted Industry jobs have grown steadily, accelerating since 2013. Of total assisted Industry jobs in the region, 87.6% are Permanent Full Time (PFT) with the rest ‘Other Jobs’ (temporary, part-time or contract). The share of PFT jobs in the region is lower than nationally (89.5%) indicating that other forms of employment are more common in the region’s industrial sector. The share of jobs that are PFT declined over the decade from 92.2% in the state and 90% in the region in 2008 indicating a rising prevalence of other forms of employment. Every western county, except Donegal, had a lower share of PFT assisted Industry jobs in 2017 than a decade earlier. In the Western Region, the share of total assisted jobs (Industry + International Services) accounted for by Industry has remained extremely stable at around three-quarters over the past decade (Fig. 1). This contrasts strongly with a steady decline nationally from 64.2% in 2008 to 55.6% by 2017. International services account for a far higher and growing share of assisted jobs nationally than in the region, where Industry continues to play a greater role. 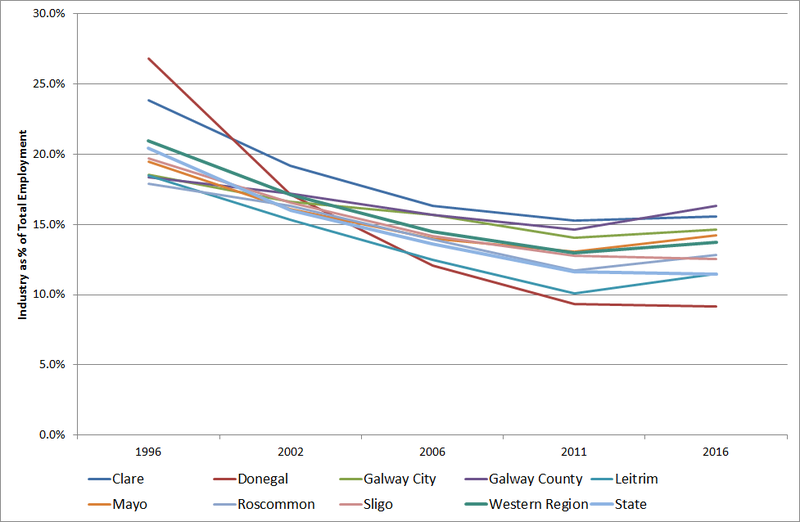 Due to confidentiality reasons, data on assisted jobs at county level is combined for Leitrim, Roscommon and Sligo. In 2017, this is where Industry accounts for its highest share of assisted jobs (88.6%). There has been a considerable increase in Industry’s importance, partly due to substantial job losses in international services over this period. Mayo has the next highest share (87.3% in 2017) in Industry with a number of significant Irish and multinational manufacturing plants but limited international services activity. In Galway, Industry’s share declined markedly between 2009 and 2012 but has remained relatively steady since as its growth in Industry and international services jobs has been similar (29.2% in Industry and 25.2% in international services during 2012-2017). While there has been fluctuation in the relative importance of Industry in Clare, by 2017 73% of Clare’s assisted jobs were in Industry, the same share as a decade earlier. Industry’s role in Donegal declined throughout the period, partly due to very strong growth in international services as well as manufacturing job losses. At 61.8% Donegal has the lowest share of Industry jobs in the region but is still above the state average. Source: Department of Business, Enterprise & Innovation (2018), Annual Employment Survey 2017, special run. Note: For ease of interpretation the vertical axis starts at 50%. MedTech dominates assisted Industry jobs in the Western Region (Fig. 2) accounting for 29.7% of all such jobs in the region compared with 13.3% nationally. For the country as a whole, Agri-food is by far the largest assisted Industry sector. As well as Agri-food, the region also has a notably lower share involved in the high-tech Chemicals & Pharma and Computer & Electronic sectors. During 2012-2017 the region performed considerably better than nationally in the region’s three strongest growing sub-sectors (Fig. 3). Valeo in Tuam would be a key factor in the strong growth in Transport Equipment, while recovery in the building industry drove the next highest growing sub-sectors. In many other sub-sectors, jobs growth in the region was relatively similar to the national experience. It did have a notably stronger performance in Clothing & Textiles while there was a decline in Mining & Quarrying jobs in the Western Region compared with growth nationally. Of total assisted Industry jobs in the Western Region in 2017, 55.1% (27,214) were in foreign owned companies, higher than the 45.3% share nationally. During the early years of the recession (2008-2012), the share in foreign ownership increased substantially (from 52.7% to 55.8%) due to large job losses in predominantly Irish owned sectors supplying construction, as well as jobs recovery beginning earlier in the foreign owned sector, strongly influenced by the performance of MedTech. While jobs growth has extended more widely in the Irish owned sector, the share jobs in foreign ownership remains at a higher level than pre-recession. Foreign ownership is not only more important to Industry in the Western Region, but the recession further strengthened its role. The ownership pattern differs across Industry sub-sectors. At 96.8% of assisted jobs in foreign ownership MedTech is very heavily reliant on FDI companies with large employers such as Medtronic, Boston Scientific and Abbot. Transport Equipment, which has shown strong jobs growth, has the next highest level of foreign ownership at 84.4%. In terms of Irish ownership, all assisted jobs in Mining & Quarrying and practically all (98.2%) in Clothing & Textiles, is in Irish owned firms. For Clothing & Textiles, the loss of previous foreign owned jobs in the sector e.g. Fruit of the Loom in Donegal, and the changing character of the sector to focus on high value, hand crafted products e.g. Magees of Donegal, Foxford Woollen Mills, means it is now largely an indigenous industry. Agri-food has the next highest level of Irish ownership at 85% of assisted jobs. Industry plays a considerably more significant role in agency assisted employment in the Western Region accounting for 3 in 4 of all assisted jobs. While Industry’s share is declining nationally, it is highly stable in the region with its strong Life Sciences cluster a contributing factor. While Industry’s share of assisted jobs has remained highly stable, there have been many changes within the sector over the past decade including a growing share of non-permanent jobs and the increased significance of foreign owned employment. Greater diversity in the industrial profile of a region increases its resilience and capacity to withstand external shocks. The region’s greater reliance on foreign ownership and the dominant role of Life Sciences (while a key regional asset) could increase the region’s exposure to risk. There needs to be a strong policy focus on further embedding existing regional strengths while also developing new areas of growth e.g. Energy, Transport Equipment, advanced engineering, to further diversify the region’s industrial profile and increase its resilience. 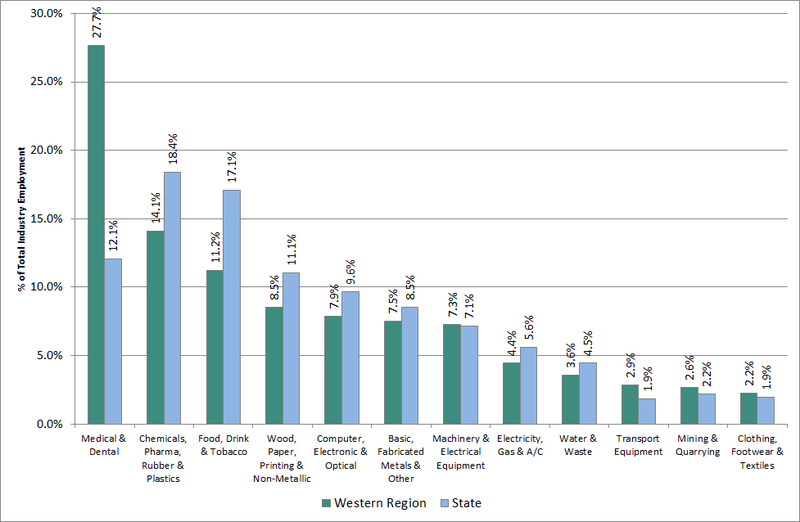 More detailed analysis of agency assisted employment in Industry in the Western Region is provided in Section 3 of ‘Industry in the Western Region: Regional Sectoral Profile’. The numbers employed at the former MBNA (now Avantcard) call centre in Carrick-on-Shannon reduced substantially over this period, as well as a number of call centre closures in Sligo. The Western Development Commission (WDC) recently published a report on Travel to Work patterns in the Western Region. Travel to Work and Labour Catchments in the Western Region, A Profile of Seven Town Labour Catchments (2018) is available for download here. The report draws on Census 2016 POWCAR data to examine the travel to work patterns in centres with a population greater than 1,000 across the Western Region. The analysis, undertaken by the All Island Research Observatory (AIRO), contains a detailed labour market profile of the principal towns in each of the seven counties of the Western Region, namely: Galway, Ennis, Sligo, Letterkenny, Castlebar, Roscommon and Carrick-on-Shannon. Of particular interest is the place of work of residents living in the Western Region and how this has changed in the last 10 years when the WDC conducted the same analysis based on Census 2006 data. In this blogpost we examine the numbers travelling to work in Dublin city from these seven centres and the extent to which this has changed over the last decade. From the analysis of 2006 Census of Population data and accompanying report, (published in 2009), see here , the numbers travelling to work in Dublin city from each of the catchments in the Western Region ranged from 73 (Roscommon) to 411 in the Galway city labour catchment. These figures represented 1.0% and 0.63% of the total catchment size respectively, see Table 1 below. Table 1. Numbers travelling to Dublin city from labour catchments in Western Region, Size of catchment and Share of catchment travelling to work in Dublin, 2006 and 2016. Examining the same data 10 years on there is quite an obvious change. Though both periods are similar in that they are characterised by strong employment and economic growth, across each of the catchments there is a considerable increase in the numbers travelling to work in Dublin city. It is also notable that while the relative population size of each of the catchments all increased, the rate of increase is not that significant. Therefore the share of the total in each catchment travelling to work in Dublin city is much greater in 2016 than it had been in 2006, now ranging from 1% in Letterkenny to 3.5% in Carrick-on-Shannon. So the numbers and the share of all resident workers in each catchment travelling to work in Dublin has all increased considerably and has generally doubled or in some cases nearly trebled (for example Ennis and Roscommon). So what are the factors behind this change? Improved transport between Dublin and the regions is also important; the example of Carrick-on- Shannon and Letterkenny applies here. The improved road and motorway networks serving Limerick (Ennis), Galway and to a lesser extent Sligo as well as intercity rail services, all make journey times quicker. Better job opportunities and the relative the lack of opportunities in the regions is another key factor. There is no doubt that especially for more senior or more specialised positions, most of these are located in Dublin. For those living in the Region and who want to progress up the career ladder, work in Dublin may be the only option. The economic crash between 2006 and 2016 and ensuing high unemployment, may have forced people living in the Western Region to take up positions in the Capital, ‘in the short-term’, but the short-term has turned into the long-term, especially in the absence of good opportunities closer to home. It is also possible that many of these positions, while based in Dublin, allow for some degree of flexibility and working from home for a day or two during the week. This can make the long commute on the alternate days more manageable for some. There is a range of data attempting to measure the incidence of e-working or teleworking and most suggest that it is on the increase. It is also likely to be a factor in retaining key personnel during periods of skills shortages and low unemployment. See WDC publications on e-working here, the Gig economy here and Home-based working here. Finally, geography is an important factor in the relative differences. It is no surprise that the share of the total catchment working in Dublin from Carrick-on-Shannon (3.5%) is much higher than Letterkenny, given its relative proximity. Recent research by Transport Infrastructure Ireland, National Road Network Indicators 2017, see here, shows the changes that have occurred in the road network between 2006 and 2017 and how this has influenced accessibility to jobs, see Page A1 showing the impact of the improved road network linking Dublin and the regions. The report notes that A significant proportion of the road capital spend from 2013 to 2017 was within the West of the country and this has resulted in improved employment accessibility for these areas. This is to be welcomed but the report also notes that despite this peripheral areas in the North-West, West and South-West and South-East still tend to suffer from poor accessibility to jobs. It is also worth noting that the decline in accessibility on routes into Dublin, due to ongoing traffic growth, are in part caused by the increased numbers of people from the Western Region travelling to the city to work. To counter this, to help ease congestion and improve accessibility into Dublin, regional growth needs to be supported and accessibility within the Regions needs to be improved. This will improve interregional mobility, enhance labour catchments and supply in the Regions and make it more attractive to do business there. The Project Ireland 2040 National Development Plan 2018-2017 commits to Enhanced Regional Accessibility as National Strategic Outcome 2. This recognises the importance of travel catchments and urban centres and their regions. From a Western perspective it is also welcome that it acknowledges the need to invest in transport to the North West which has been comparatively neglected until recently. From an interregional perspective, the commitment to deliver the Atlantic Corridor, linking Cork, Limerick, Galway and Sligo is very important. Enhancing this network will improve travel to work times within the region, helping to improve accessibility and improving job prospects for residents within the Region. It will also hopefully make the region more attractive for new job creation. While the Plan notes that the Atlantic Corridor will be delivered progressively, it is hoped that it will be completed as timely as possible, both for those commuters who wish to find work closer to home and to realise the wider objectives of regional growth under Project Ireland 2040.
https://www.wdc.ie/wp-content/uploads/ttw.jpg 501 630 WDC https://www.wdc.ie/wp-content/uploads/wdc-567.png WDC2018-07-30 13:00:432018-07-23 14:59:04Travelling from the Western Region to work in Dublin. How has it changed and Why? The biggest change in the Western Region’s labour market over the past year has been an exceptionally rapid expansion in self-employment. According to a special run of the CSO’s Quarterly National Household Survey for Quarter 1 2016 for the Western Region, between Quarter 1 2015 and Quarter 1 2016 the number of people in the Western Region who are self-employed grew by 15.4%. That was an increase of 10,000 people, from 65,000 up to 75,000. This was in sharp contrast to the change in the number of people who were working as employees in the region, which actually declined marginally over the same period -0.2% (from 249,600 down to 249,200). There has been a steady upward trend in the numbers self-employed in the region since 2012, but 2016 was marked by an exceptionally large rise (Fig. 1). From Fig. 1 it can be seen that the number of self-employed who are employing others actually declined between 2012 and 2014 but has grown strongly since. Indeed between 2015 and 2016 this type of self-employment increased by a quarter (up 25%). The strong growth in the number with employees is a very positive indication of the growth potential of some of these businesses. Currently there are 19,000 people self-employed and employing others in the Western Region. Self-employed with no paid employees is by far the more common type of self-employment however. This has grown in each year since 2012, except 2015, and increased by 12.4% in the past year to now stand at 56,000. This type of self-employment plays a key role in ensuring that people can continue to live and work in smaller towns and rural areas. The growth in self-employment was the sole driver of any jobs growth that took place in the Western Region in this period. The total number of people at work in the region rose by 3.5% between Q1 2015 and Q1 2016 and this was entirely due to self-employment. The massive growth in self-employment between 2015 and 2016 was unique to the Western Region. For the rest of the state (all other counties in Ireland combined) the number of self-employed people actually fell during this period by -1.3%, it was the same for those with and without employees. The number of people working as employees grew however (up 2.8%) in contrast to the decline experienced in the Western Region. Total jobs growth in the rest of the state was lower than that in the region (2.2% v 3.5%) over the period and the region’s stronger overall performance was caused by people creating their own jobs. While the region had stronger jobs growth during 2015-2016, over the longer period since 2012 the region has had lower growth. The total number in employment rose by 6.4% in the Western Region between 2012 and 2016, but by 8.7% in the rest of the state. The Western Region’s labour market differs markedly from that elsewhere. The recent growth in self-employment in the region has further reinforced its key role. 22.9% of people at work in the Western Region work for themselves, while in the rest of the state it is 15.2% (Fig. 2). In the rest of the state the share of self-employed has not fluctuated a great deal over the past decade. There was only a 1.5 percentage point difference between the highest and lowest years. In the Western Region, volatility has been far greater with a 4.3 percentage point difference between the highest (2016) and lowest (2012) years. It is notable that the share now in 2016 is even higher than it was in 2007 or 2008 when self-employment in the construction sector would have been at its highest. The underlying factors driving strong self-employment growth in the region are varied and complex. The relative lack of more standard forms of job opportunities, especially in smaller towns and more rural areas can mean that in order to remain living in these areas people need to choose the option of self-employment. General trends in the world of work such as the growth of the so-called ‘gig economy’, contract working and trends to outsourcing of certain services and activities by larger companies (e.g. transport) is also driving growth in self-employment, though whether such trends would manifest themselves more strongly in the Western Region is unclear. The other key explanation for the growth in self-employment, while employee numbers fell, was the sectoral pattern of jobs growth during this period. At a sectoral level the strongest jobs growth by far was in accommodation & food service, perhaps partly influenced by the Wild Atlantic Way tourism initiative as well as increasing domestic demand, followed by transportation & storage and construction (Fig. 3) all of which are sectors that show high levels of self-employment. The 2014 Business Demography data showed that in the Western Region 88.8% of those working in accommodation & food service enterprises were employees with the remainder (11.2%) either owners or relatives. In the rest of the state only 6.5% were owners/relatives showing greater self-employment in this sector in the region. For transport the share of owners/relatives was 33.7% in the region compared with 21.5% in the rest of the state while for construction the difference was 43.4% in the region compared with 30.1% elsewhere. The three sectors with the strongest jobs growth in the Western Region between 2015 and 2016 all exhibit a far greater extent of self-employment in the region. In contrast, industry, the sector which has the highest share of employees (96%) and therefore the lowest share of self-employment (4%), actually had jobs decline in the Western Region between 2015 and 2016. The predominantly public service sectors of education, health and public administration, which would have low shares of self-employment, also reduced employment over the past year. Increasingly, jobs growth in the Western Region is driven by self-employment and far more so than in the rest of the state. This has significant implications for how jobs growth in the region is being, and can be, supported and encouraged. It shows the importance of supports for the self-employed including issues around social protection, enterprise supports especially soft supports as many may be in locally trading sectors not eligible for grant aid, work space, broadband access and opportunities for networking. The growth in the number of self-employed with employees is very positive and shows the potential contribution of the self-employed to jobs growth. It also shows the importance of making it as easy as possible for the self-employed to begin hiring employees as well as the provision of information and advice on employment law and employee rights. At the same time, these figures raise concerns about the capacity of job creation in other types of businesses, as the number of employees actually declined in the past year in the region while growing elsewhere. This seems to have been due to employment in the predominantly public sectors of education and health (significant employers) falling in the region, while growing in the rest of the state. Jobs in industry and information & communications also declined. We will return to the topic of 2016’s sectoral employment performance in a future post, but for now it is important to note that in the Western Region those sectors driven by self-employment are strongly out-performing the others.